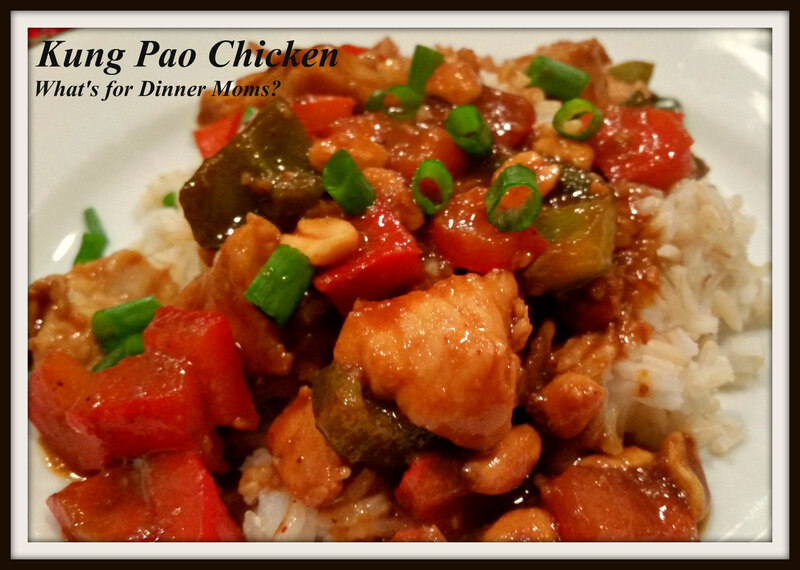 Kung Pao Chicken – What's for Dinner Moms? I had a bit of extra time last night so I decided to make Kung Pao Chicken. I stopped at the store on the way home and picked up green peppers, red peppers, green onions, soy sauce and peanuts. I also picked up a few extra fresh ingredients for our next couple meals. But, I still forgot the milk! There is always one thing I just forget even with my list in hand. My kids were really excited for this dish. They love homemade Chinese food. I like that I know exactly what we are eating and can control the amount of oil and sugar it is cooked with. My daughter helped by making the sauce for the dish as I chopped the vegetables. I asked my children last night at dinner if they are both feeling more confident in the kitchen and feeling like they can cook several things so that when it is time for them to leave the house they can cook for themselves. Both eagerly replied yes. They started listing the dishes that they knew how to cook and how they could transfer what they know into making other dishes too. It made me smile. This was a hit! My daughter did not like the fact that I mixed the brown rice and white rice (50/50) but I am trying to ease everyone into eating brown rice. They don’t like the taste and texture of the brown rice but I am working on that too by cooking it in chicken stock and adding a few spices. In a large bowl mix cornstarch and chicken until coated well. In a second bowl mix soy sauce, rice wine vinegar, Hoisin sauce, sesame oil, brown sugar, ground ginger and Cayenne until well blended and sugar has dissolved. Taste and adjust spices according to your tastes. Add 1/3 of sauce to chicken and stir to coat. In a wok or large sauce pan add a bit of oil to pan. Allow to warm and add garlic to pan. Cook for 30 seconds to 1 minute to become fragrant. Add peppers and any other vegetables and allow to cook for 2-3 minutes. Add chicken to vegetables and stir fry until chicken is cooked through. Add chilies, if desired, to the dish and let cook for 30 seconds or so. Add remaining sauce to pan and stir until sauce is thickened. If sauce is not thick enough add 1/2 teaspoon of cornstarch mixed with 1 tablespoon of water to pan to thicken. Serve over rice if desired and garnish with green scallions and peanuts. Thank you for reading! My kids are better about brown bread than brown rice. Definitely a texture thing for them. This is awesome! Thanks for sharing 😊 and I will try your recipe very soon! Thank you for you kind words! I hope you like it as much as we did! Thanks for the recipe. I had it in mind for some time. Definitely going to make it. Looks delish…I have to try it out! I always seem to run across the most amazing looking food when I’m hungry! lol This looks outstanding! That looks absolutely like restaurant quality! Thank you! You are so very sweet! Gorgeous, Marci! I should have eaten lunch before reading your blog! Does koolaidmoms deliver?? lol! Thank you, Lana. I am still trying to figure out why WordPress adds an orange-like tint to my pictures when they don’t look like that before I post them. Any ideas? Oh Sweetie…with my help you’d have psychedelic Kung Pao! lol! I do know someone who used to work or still works for wordpress his name is Sandy…here’s his link http://sandymcfadden.com/ Good luck & hopefully he can give you some ideas! I think it looks great though, hon! this looks so good! yummm!